I’m happy to be back in Istanbul after spending most of the summer at our seaside retreat. We were rocked by a moderately disturbing earthquake in Bodrum – but it seems the big city suffered worse damage from torrential rain and a storm of super-sized hailstones. Gentle reminders from Mother Nature about who’s actually in charge on this planet. Anyway, I have to start work again, a necessary evil in order to sustain a lifestyle above subsistence level. My good lady is still out of town, so, looking for ways to amuse myself in her absence, I headed over to the European side of the city. I was keen to see Taksim Square, Gezi Park and İstiklal Avenue, having heard so much negative comment about their descent into a black hole of fundamentalist Islamic horror. Not easy to get into. Could that be significant? My first target was Küçükçiftlik Park, which I had seen advertised as venue of the 4th Istanbul Coffee Festival. I passed through tight security before emerging at a ticket booth totally lacking in any kind of queue. On asking the entry price I understood why . . . 35 Turkish Liras! What? Unable to believe what the young lady had said, I asked, “What’s in there? Is it worth it?” I took her momentary hesitation to mean that she herself had doubts, so I headed for the exit. 35 Liras! Last year it had been held in the grounds of Topkapı Palace, and admission was free. So what had changed over twelve months? While in the vicinity I decided to check out Maçka Democracy Park, a good-sized island of greenery (yes, another one) in the inner city I hadn’t visited in a dog’s age. It was named in happier times when regular military coups ensured the preservation of democracy and secularism, at least for the nation’s ruling elite. It turned out that visiting the park was easier said than done. Clearly much of the lower end has been leased out to whatever private concern is now scalping citizens for entry to the Coffee Festival, and I had to walk a kilometre or so up the hill to find a gate. I was pleased to find that the cable car I remembered from years gone by still crossed the valley from Şişli to Taksim – and more pleased yet to find that the spectacular view over woodland to the Bosporus was less disfigured these days by youthful inscriptions etched into the perspex windows of the carriage. A short walk brought me to Taksim Square, still a rather barren space despite council claims that they had planted a large number of trees. Gezi Park, location of much political excitement four years ago, is actually a rather more accessible and pleasant spot than in former times. The whole area has been closed to motor traffic which has been diverted underground. An exhibition area hosts thematic displays of handcrafts and the wares of micro-businesses. On this particular day, dozens of stalls were purveying second-hand books, classic movie posters and prints of old Istanbul, and several outdoor cafes offered Turkish coffee brewed slowly, in the traditional way, on glowing charcoal. Feeling a little hungry, I headed down a back street and found a tasteful little restaurant calling itself “Gezzy” where I enjoyed a most delicious pide, a kind of Turkish pizza with cheddar cheese, tomatoes and green peppers. From there, I carried on down the road known as Tarlabaşı Boulevard. On the downhill slopes to my right spread the colourful neighbourhood featured in numerous Turkish films about the underground life of gypsy music, prostitution in all its multitudinous guises, and the world of crime in general. I remember, years ago, on first seeing the narrow lanes of rundown Victorian tenements (or whatever the Ottoman equivalent was), wondering when the mixed blessing of gentrification would arrive in an area so close to the beating heart of the metropolis. Well, arrive it has – amid much fanfare, accompanied by somewhat justified wailing and gnashing of teeth. A green space in central Istanbul – but just try to get in! I cut back up the hill towards Beyoğlu, passing by the fortress-like walls of the British Consulate. Built in 1845 as an embassy, in ostentatious imperial neo-classical style, adorned with the requisite inscription in Latin and the date in Roman numerals, the enormous edifice provides little in the way of services, to locals or UK citizens. A bombing fourteen years ago that killed a number of Turkish citizens, and accidentally got the Consul-General, led to the building of a defensive wall. Once an important outpost of empire in the Ottoman capital, Pera House these days looks like little more than an expensive anachronism. The back streets running more or less parallel to İstiklal Avenue, the commercial thoroughfare leading out of Taksim Square, are lined with imposing buildings of similar vintage in various states of decrepitude and restoration: The Pera Palace Hotel, famed for its role in accommodating wealthy travellers disembarked from the Orient Express; the Grand Hotel de Londres, a reminder that French was a more fashionable language than English in those days; the Italianate façade of the Beyoğlu Council building, erected in 1857. These and more recall that for centuries, in Ottoman times, and before, when the city was capital of the Eastern Roman Empire, citizens lived in the ancient city across the Golden Horn. The district known variously as Pera, Galata or Beyoğlu was a satellite town of foreign traders and diplomats. Most visitors to modern Istanbul take time to visit Galata Tower, built by the Genoese in 1348, and providing panoramic views of the city from its 63-metre viewing deck. In those days, the Genoese and their Venetian neighbours controlled trade in the Mediterranean, and it was their contact with Eastern civilisations that contributed to the Renaissance in Europe. Subsequently their control was challenged and more or less replaced by Ottoman power – which may have been a major motivation for Western Europe to get its political act together in the interests of defence. I had thought Galata Tower was the only remnant of the walls that formerly enclosed the enclave of Galata, but as I walked down the hill towards the Golden Horn I came across another tower and section of ancient fortification in a sorry state of decay. Turkey is often accused of failing to protect its rich architectural heritage, but when you get out and wander around the city, or the country as a whole, you may be overwhelmed by the sheer volume of ancient churches, castles, mosques, temples, bathhouses, theatres, stadiums, city walls . . . Every day, it seems, some farmer ploughing his field turns up the mosaic floor of an opulent Roman villa. This is world heritage – but mostly Turkey is expected to foot the bill for protection and/or restoration. Just as the Middle East refugee tragedy is a global problem – but largely locals are left to house and feed the displaced homeless. Behind the decrepit tower I caught a glimpse of a bell tower clearly belonging to a Christian church. I wandered round the block trying to get closer, but it was well protected by the walls of a decaying 18th century inn, and a locked gate. Nevertheless, I did identify it as an Italian Catholic church dedicated to the apostles Peter and Paul, erected in 1843 to replace a more ancient edifice that had been converted to a mosque in 1475 after the Ottoman conquest of Constantinople. So were those French and British financiers claiming to be friends of the Ottomans? Well, that friendship didn’t turn out so well for the locals in the end, did it! Empires come and go, but leopards don’t change their spots. 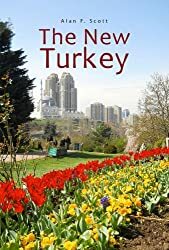 This entry was posted in arts and culture, Banking and finance, history of Turkey, Ottoman Empire, treasures of Turkey, Urban development and tagged Istanbul, Istanbul parks, Urban development. Bookmark the permalink. Thank you so much for sharing this Alan! Fascinating! It’s an amazing city. I never get tired of wandering around. As informative as Orhan Pamuk! Have added a new list of book titles! Will keep adding…..